Wednesday, McDonald's made the bold announcement that all soft drinks regardless of size will cost only $1 starting in April. Additionally, McCafé beverages – smoothies, frappes, and espressos – will set folks back just $2 for the (undisclosed) length of the promotion. Why is the fast food leader cutting only drink prices? And why now? In a recent post, we showed how McDonald's is winning the QSR coffee wars. A lot of people drink its coffee and a lot of people enjoy it, including espresso. Sacrificing a bit of direct revenue from these extremely high-margin drinks should, the thinking goes, pay off as greater numbers of happy consumers flock to the counter to order them. But McDonald's is also increasingly threatened by the perception of its prices within the greater buyers' conversation about fast food prices. The blue line shows that the number of customer conversations around the fast food burger space has increased steadily over the last 4 years. This reflects the reality that many Americans are facing economic challenges causing them to rethink their spending habits. 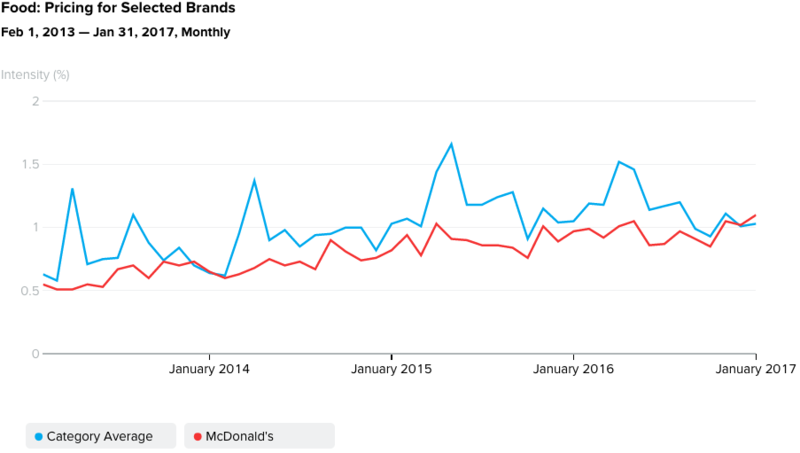 Yet the red line, which shows the number of McDonald's customer conversations about price, is rising much more sharply and even recently eclipsed the category average. Now, an astute observer might ask "Why is a jump in conversations about pricing necessarily bad? What if most people are applauding the pricing?" Thanks to the addition of sentiment analysis to SIGNUM we can know the answer to these valid questions. And the answer should be concerning to the execs at McDonalds; customers are not applauding. Here is a closer look at the McDonald's line with sentiment analysis highlighted in green and red at the bottom. As we established in the previous chart, the number of McDonalds customer conversations about price is clearly going up – and rising at a faster rate than the category average. Here we note the sentiment within that buyer's voice is clearly trending negative. At the end of of 2016 we see that pricing sentiment skews almost 3x negative, one of the worst splits for the chain over the last 4 years. A competitor could use this information in several ways. The aforementioned coffee post showed that coffee connisseurs prefer 6 other burger chains to McDonalds; one could pair with a premium label like Peet's to attract the audience willing to pay for quality. Another chain could slash prices on burgers, opening a new front on the price wars. Another could acknowledge the elephant in the room in its marketing campaigns, and share empathy with American fast food consumers during these uncertain economic times. So why did McDonalds slash drink prices? Nervous customers across the QSR category are talking more frequently about cost. McDonald's customers are especially concerned about prices, and they're sharing high levels of negative sentiment about the issue online. The chain therefore made the logical move to cut prices on some of its highest-margin and most-enjoyed items: sodas and caffeine drinks. It all makes sense; the only question is whether it will be enough to stem a receding tide. The SIGNUM for Restaurants platform gives access to this kind of competitive intelligence 24x7 so companies can capitalize on competitor vulnerabilities and blindspots before the brand is even aware of the problem. Please reach out to us at contact@quantifind.com to learn more now.